There is a curious bitter sweetness in the Melancholy in which we clothe ourselves at times. Paradoxically, it is the great intensity of Love which inspires great creativity when that Love is lost. 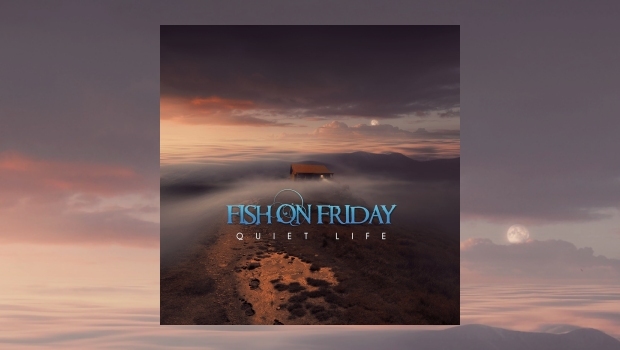 Loss affects us all in different ways and it seems evident from the content and sleeve notes of Quiet Life that the main song writer for Fish on Friday, Frank Von Bogaert, has experienced considerable sadness since their last album, Godspeed. I don’t know the details, nor do I need to know them as that is personal to the artist, and such opacity allows the listener to delve in to the music and form their own lucid personal connections. Quiet Life is an emotional release lyrically and musically, and shows how they have really matured into a fine melodic progressive rock band. Formed in 2009 in Belgium by Frank Van Bogaert and William Beckers, along with Marcus Weymaere on drums and Californian guitarist Marty Townsend, Fish on Friday have now fully embedded the legendary bassist Nick Beggs, renowned band member with Steve Hackett, Steven Wilson and The Mute Gods, to add to and underline the quality of their musicianship. The song which may attract most interest underlines the comparisons often made between Fish on Friday and the Alan Parsons Project. Therefore, it seems apt that Bogaert fulfilled a lifelong ambition in working with the legendary producer as Alan Parsons produced and sang backing vocals to the penultimate song, In the Key of Silence, at the iconic Abbey Road studios, where he worked with The Beatles and Pink Floyd. The versatile and talented John Mitchell (Frost*, It Bites, Arena & Lonely Robot) guests on that song with characteristically finely judged guitar. Henry Ylen’s subtle saxophone adds to this atmospheric and melodic number, and one can hear why the Alan Parsons Project comparisons are made as this song would fit in very well with some of the better A.P.P. albums… but there are better songs on this album. 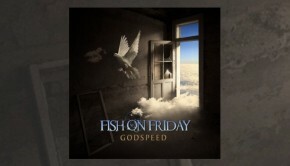 The surprise extra ingredient to this particular musical dish from Fish on Friday is the additional vocals from Lula Beggs, daughter of Nick Beggs. Her more indie rock type voice gives more substance to the rather lighter Gilmour-esque vocals from Van Bogaert, particularly on the lovely rolling rock of Sweet Love. Sometimes Fish on Friday can feel almost too smooth and she is the grit that helps form the pearl on a couple of their songs. She really comes into her own in Quiet Life when she sweetly takes over the vocals on this slowly building song which balances the sorrowful lyrics over an almost joyful musical backing, mirroring the solace taken in withdrawal to a quiet place in times of sadness. That attempt to teeter on the tightrope between sorrow and comfort is not always successful in my view, as in Beautiful where the lyrics directly reference their love of Pink Floyd, which tries in places to weld heartbreaking words over almost celebratory music making it difficult to comprehend or absorb as a listener – are we meant to be happy or sad, or is that just a reflection of the mixed up emotions of the artist? I am not sure it works for me. Get Up is more straightforward and encourages the person to recover from their sadness in a fairly simple undemanding soft rock song, but which does not really ignite the soul. The bitter feelings behind You’ve Hurt Me are unmistakable as it builds from a sonorous beginning. Backed by the fine backing vocals of Stef Caers, Chantal Kashala and Nina Babet, the song rises in volume and intensity with great drumming by Marcus Weymaere as Van Bogaert concludes that even though he was hurt he was not broken – triumph drawn from disaster? Fish on Friday are more comfortable in more expansive and ambiguous territory which allows them to paint more atmospheric musical scenes, such as Snowed In, which somehow conveys in music that unmistakable sense of sound clothed in a shroud of snow. The strengths of this band are best exemplified on the elegiac beauty evoked in MH17, about the Malaysian Airlines plane shot down over Ukraine in 2014. Legendary woodwind player Theo Travis adds flute and clarinet to help evoke the airborne tragedy which befell those fated passengers and crew. Marty Townsend’s guitars swoops and interweaves with Travis’ flute. Having reached such heights of sadness about that tragedy it has to be said that placing the personal bitterness of You’ve Hurt Me and its driving rock central core do seem to jar the atmosphere – the sequencing of albums is crucial and in my view this juxtaposition thematically and musically simply does not flow, and I find myself skipping the latter song. Time Out brings the album to a close with a lovely bass line from Nick Beggs and a fine dreamy echoing vocal from Van Bogaert over William Beckers’ delicate organ. It seems an appropriate place to bring us full circle as the artist withdraws into a comforting cocoon of solace. There is much to savour in this fine album, despite a couple of incongruous mis-steps. The lyrics are certainly a considerable improvement from Godspeed, and that may be due to a natural development, but also may be due to the more deeply felt nature of much of this album. When the words and music are this close to the heart and drawn from evident personal loss then they feel more resonant. Strange as it may be to say, but in this artist’s evident deeper sadness there is more enjoyment and satisfaction for the listener.